Bitter Melon (Momordica charantia), commonly referred to as bitter gourd, karela, and balsam pear, is widely used as a vegetable in Bangladesh and several other countries in Asia, the Amazon, East Africa, and the Caribbean. The food looks like a bumpy cucumber and has a pungent taste. Bitter melon also has a strong history of use in folk medicine. Bitter melon nutrition facts vary slightly based on the part of the plant that you use. One ounce (28 grams) of the raw leafy tips provides about 8 calories. One ounce of the pods provides just under 5 calories. Even though bitter melon calories are very low, keep in mind that the nutrition changes if you add other ingredients (such as oil) to prepare it. Most of the calories in bitter melon come from carbohydrate, but since the calories are very low, the carbs in bitter melon are also low. One entire bitter melon (about 124 grams) is likely to provide about 4.5 grams of carbohydrate, most of which is fiber (3.5 grams), according to USDA data. There is very little fat in bitter melon. One entire bitter melon contains less than a single gram of fat. Bitter melon is not a good source of protein. There is just over 1 gram of protein in a single bitter melon. Micronutrients in the vegetable again vary based on the part of the vegetable that you eat. If you consume the pods, you'll benefit from vitamins including vitamin A, vitamin C, and folate. Minerals in the pods include calcium, potassium, iron magnesium, sodium, zinc, and selenium. If you consume the leafy tips, you'll consume the same micronutrients in slightly higher amounts. Bitter melon is not a good source of any micronutrients except for vitamin C.
Bitter melon juice, fruit, and dried powder are reported to possess antioxidant, anti-inflammatory, anti-cancer, anti-diabetic, anti-bacterial, anti-obesity, and other disease prevention properties. Though research is ongoing, strong clinical evidence does not exist to support all of bitter melon's medicinal uses. In Asia, South America, India, and East Africa, bitter melon is often used to treat diabetes. However, a published review concluded that high-quality studies with human subjects are limited and often too flawed to provide strong enough evidence. A 2014 study published in Nutrition and Diabetes showed that bitter melon did not provide any significant benefit to diabetic patients. Another published review evaluated evidence regarding the use of bitter melon to treat high cholesterol, obesity, cardiac function, hypertension, and certain cancers. Again, authors also note that most bitter melon studies suffer from poor design and conclude that more high-quality research is needed to understand bitter melon benefits. Is bitter melon really a melon? Bitter melon doesn't look like a melon so many people question if the name is inaccurate. In fact, it looks more like a cucumber. But, the vegetable comes from the same family (Cucurbitaceae) as watermelon and cantaloupe, so the name is not incorrect. Where and when can I buy bitter melon? 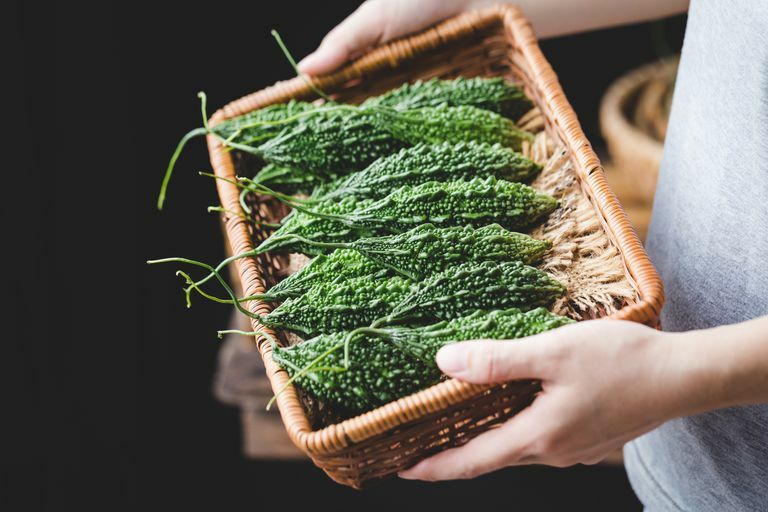 You're not likely to find bitter melon in many chain grocery stores. But many Asian markets carry it all year long. At farmers markets, you might see it at the end of summer or beginning of fall. How do I choose the best bitter melon? Different types of bitter melon have different color variations. In general, however, if you buy a green bitter melon, it is probably not ripe yet. However, many cooks use bitter melon that is not fully ripe in recipes. Store bitter melon the same way you would store other vegetables. Keep it in the refrigerator until you are ready to use it. To cook bitter melon, you'll want to remove the waxy skin with a peeler or a paring knife. Many cooks boil bitter melon, steam it, or use it in a stir-fry. Others hollow out the vegetable and stuff with ingredients such as pork sausage or chilies. Some people enjoy the bitter taste of bitter melon. If you don't, culinary experts recommend that you soak the vegetable in salt water for 30–45 minutes before cooking with it. According to one published evaluation of bitter melon, adverse effects may include hypoglycemic coma and convulsions in children. According to Memorial Sloan Cancer Center, the seeds and wall of the fruit contain alkaloids that cause vomiting and diarrhea. Researchers have also observed reduced fertility in mice, headaches, and glucose-lowering properties. For this reason, bitter melon may not be safe to use when taken with other glucose-lowering agents or insulin. Health experts also advise that pregnant women avoid bitter melon as it can cause can cause vaginal bleeding, premature contractions, and abortion. Bitter Melon. Natural Medicines Comprehensive Database. Professional Monograph. Nov. 7, 2017. Bitter Melon. Memorial Sloan Kettering Cancer Center. About Herbs, Botanicals & Other Products. April 3, 2017. Joseph B, Jini D. Antidiabetic effects of Momordica charantia (bitter melon) and its medicinal potency. Asian Pac J Trop Dis. 2013;3(2):93–102. DOI: 10.1016/S2222-1808(13)60052-3. Alam MA, Uddin R, Subhan N, Rahman MM, Jain P, Reza HM. Beneficial role of bitter melon supplementation in obesity and related complications in metabolic syndrome. J Lipids. 2015;2015:496169. DOI: 10.1155/2015/496169. Yin, R. V., Lee, N. C., Hirpara, H., & Phung, O. J. (2014). The effect of bitter melon (Mormordica charantia) in patients with diabetes mellitus: a systematic review and meta-analysis. Nutrition & diabetes, 4(12), e145. DOI: 10.1038/nutd.2014.42. Basch E, Gabardi S, Ulbricht C. Bitter melon (Momordica charantia): a review of efficacy and safety. Am J Health Syst Pharm. 2003;60(4):356-9. PMID: 12625217. Saad, D. Y., Soliman, M. M., Baiomy, A. A., Yassin, M. H., & El-Sawy, H. B. (2017). Effects of Karela (Bitter Melon; Momordica charantia) on genes of lipids and carbohydrates metabolism in experimental hypercholesterolemia: biochemical, molecular and histopathological study. BMC complementary and alternative medicine, 17(1), 319. DOI: 10.1186/s12906-017-1833-x.